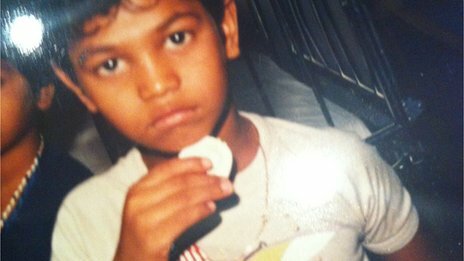 Saroo Brierley was only 5 years old when he got lost. He was traveling with his older brother, working as a sweeper on India’s trains. It was late at night. We got off the train, and I was so tired that I just took a seat at a train station, and I ended up falling asleep. That fateful nap would determine the rest of his life. I thought my brother would come back and wake me up but when I awoke he was nowhere to be seen. I saw a train in front of me and thought he must be on that train. So I decided to get on it and hoped that I would meet my brother. Saroo did not meet his brother on the train. Instead, he fell asleep and had a shock when he woke up 14 hours later. Though he did not realize it at first, he had arrived in Calcutta, India’s third biggest city and notorious for its slums. I was absolutely scared. I didn’t know where I was. I just started to look for people and ask them questions. It was a very scary place to be. I don’t think any mother or father would like to have their five year old wandering alone in the slums and trains stations of Calcutta. The little boy became a beggar, one of the many children begging on the streets of the city. I had to be quite careful. You could not trust anyone. Once I was approached by a man who promised me food and shelter and a way back home. But he looked very suspicious. Ultimately I think he was going to do something not nice to me, so I ran away. Saroo was taken in by an orphanage, which put him up for adoption. He was adopted by the Brierleys, a couple from Tasmania. I accepted that I was lost and that I could not find my way back home, so I thought it was great that I was going to Australia. Saroo settled down well in his new home. But as he got older the desire to find his birth family became increasingly strong. The problem was that as an illiterate five-year-old he had not known the name of the town he had come from. All he had to go on were his vivid memories. So he began using Google Earth to search for where he might have been born. I multiplied the time I was on the train, about 14 hours, with the speed of Indian trains and I came up with a rough distance, about 1,200km. He drew a circle on a map with its centre in Calcutta, with its radius about the distance he thought he had travelled. Incredibly, he soon discovered what he was looking for: Khandwa. When I found it, I zoomed down and bang, it just came up. I navigated it all the way from the waterfall where I used to play. Soon he made his way to Khandwa. He found his way around the town with his childhood memories. Eventually he found his own home in the neighbourhood of Ganesh Talai. But it was not what he had hoped for. When I got to the door I saw a lock on it. It look old and battered, as if no-one had lived there for quite a long time. 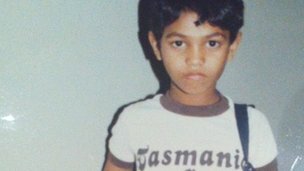 Saroo had a photograph of himself as a child when h ejust arrived to Tasmania (look the photo below these lines) and he still remembered the names of his family. A neighbor said that his family had moved. Another person came and then a third person turned up, and that is when I struck gold. He said: Just wait here for a second and I shall be back. And when he did come back after a couple of minutes he said, Now I will be taking you to your mother. I just felt numb and thought, Am I hearing what I think I am hearing? Saroo was taken to meet his mother who was nearby. At first he did not recognise her. The last time I saw her she was 34 years old and a pretty lady, I had forgotten that age would get the better of her. But the facial structure was still there and I recognized her and I said, Yes, you are my mother!!! She grabbed my hand and took me to her house. She could not say anything to me. I think she was as numb as I was. She had a bit of trouble grasping that her son, after 25 years, had just reappeared like a ghost. Although she had long feared he was dead, a fortune teller had told Saroo’s mother that one day she would see her son again. I think the fortune teller gave her a bit of energy to live on and to wait for that day to come. And what of the brother with whom Saroo had originally gone travelling? Unfortunately, the news was not good. A month after he had disappeared his brother was found in two pieces on a railway track. His mother had never known whether foul play was involved or whether the boy had simply slipped and fallen under a train. We were extremely close and when I walked out of India the tearing thing for me was knowing that my older brother had passed away. For years Saroo Brierley went to sleep wishing he could see his mother again and his birth family. Now that he has, he feels incredibly grateful. He has kept in touch with his newly found family. And there is something to make him sleep better, based on the gr4eat success of the film Slumdog Millionaire, several publishers and producers are getting interested to buy his incredible story and take it to the big screen.